Sometimes it might feel like your brain acts against your own interests. Who hasn’t regretted that extra pint or an unaffordable shopping spree? But what if your brain was controlling a part of your body against your will? This is a relatively rare but mind-boggling condition called alien hand syndrome, where patients have the sensation of a limb acting without their control. It can feel like their arm is disobedient, and has “a will of its own”. The condition appears in the 1964 film Dr Strangelove, where the eponymous character is shown to have the condition. Medically, it was first documbetween the two hemispheres of the brain (the corpus callosum) cut. ented in patients who had undergone surgery to treat epilepsy, though it can occur after other types of brain surgery, stroke, brain tumours, infections or certain degenerative brain diseases. It is best understood in patients with epilepsy who have had the connection Following this surgery patients are generally able to continue their lives as normal, but in some cases the effects can be dramatic. Patients with alien hand syndrome report that following the surgery one arm (and sometimes leg) feels like someone else’s, and describe the arm’s behaviour as not their own. Some patients may even be unaware of the actions of their hand. One patient who suffered a severe case of alien hand syndrome and appeared in the 2011 BBC documentary “The Brain: a Secret History”, described how her “alien” left hand would take things out of her handbag without her knowledge, or stub out a cigarette that her right hand had just lit. In cases where the “alien” hand performs goal-directed behaviours such as these, it may perform actions directly opposed to the unaffected hand, leaving the hands apparently bickering. For instance, while the unaffected hand tries to pick up a mug, the other moves it away. Conversely, the affected hand may involuntarily mirror the actions of the other hand. 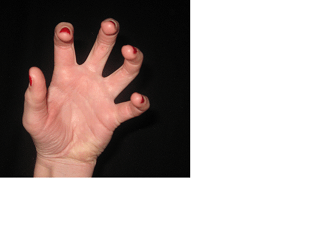 For these patients, when instructed to perform an action with the unaffected hand, they may be unable to do so without the affected hand attempting the same movement. In another case, reminiscent of a horror film plotline, following serious heart surgery, a patient found that her left hand was no longer under her control, and would even try to choke her. Frighteningly she had to physically restrain it with her right hand to avoid injury. So what is going on in the brain to allow this to happen? Brain imaging research has found that alien hand movements, like normal hand movements, are accompanied by activity in the primary motor cortex (a part of the brain critical to producing movements). But this occurs without the usual preceding activity in the premotor cortex (another part of the brain involved in planning and producing motor actions), and other regions involved in planning behaviours. In patients who have had the connection between the hemispheres cut, it is possible that interhemispheric premotor to motor cortex activity is disrupted. So, in effect, the motor cortex is acting without the usual sequence of brain activity that controls it and gives us a sense of the action being one we’ve chosen to do. In addition, in the healthy brain, motor actions are accompanied by a signal to the sensory parts of the brain that will experience it (an efferent signal; see an earlier post on this blog about how this stops us from being able to tickle ourselves here). If this efferent signal is absent or faulty, your own actions may feel like someone else’s. Although it is still not fully understood what changes in the brain lead to alien hand syndrome, it seems possible that a combination of these disturbances in the brain may contribute to the sensation of the hand being autonomous. This condition has fascinated scientists for many years, and raises interesting questions about how we experience physical sensations. Science’s limited view of the world causes such information gap to occur. The explanation has been around forever, but people are not willing to accept it causing sane people to be misdiagnosed for ailments they don’t have. Sometimes a spade really is a spade. Oh my goodness! Amazing aгtiflе dude! Thhank you, However I am encountering difficulties with your RSS. I don’t know the reason why I can’t join it. Is there anybody having the ѕame RSS problems?